Short term care may last between a few hours to a few months. 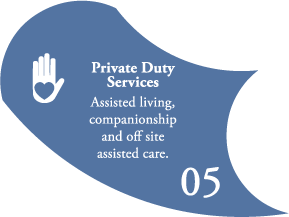 When a client requires short term care, they will receive the same help as our clients who require long term care. Generally, the care is provided on a temporary basis as the client may be recovering from surgery, treatable injury or illness such as pneumonia. In situations like this, home care is beneficial as it allows the client to return to their activities of daily living at a quicker rate than if they were to recover on their own. 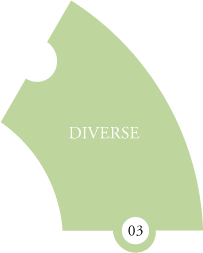 The care that a short term client may require outside of the “typical” long term services are likely to include assistance with wound assessment, dressing changes, IV medication administration, temporary around the clock vitals assessing, etc. Long term care services are most often for clients with chronic and/or progressive conditions, such as a spinal cord injury, a debilitating stroke, ALS, etc. In instances such as these, regular assistance and care are required. 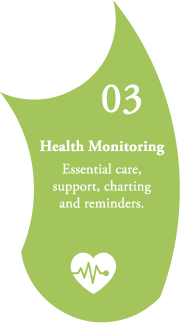 Typically, a client’s need for care is likely to increase if their condition is one that is likely to cause a decline in their health. Most family members would prefer to have their loved ones remain as family, rather than developing a caregiver/client relationship. 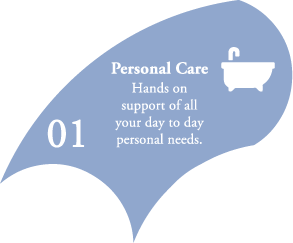 Bathing your spouse or parent seems like a basic task; but adjusting a feeding tube, monitoring wound care and assisting with elimination is more than families feel like they can adapt to while still maintaining a loving and lasting relationship with their loved one. Assisting the client to avoid hospitalization or admission to LTC/institution – constant monitoring, infection control, skin assessments, health promotion, etc. 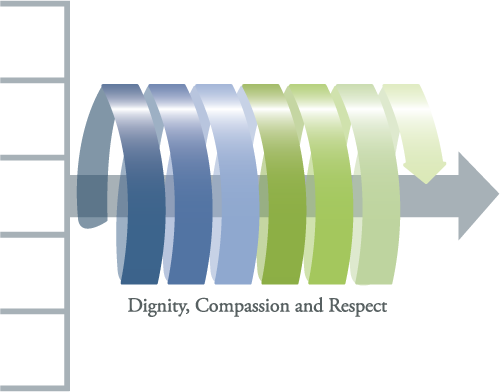 Genuine Health prides itself on providing care with dignity, compassion and respect. 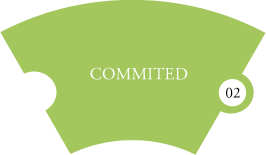 It’s through the execution of these three words that we have found success for our staff and for the clients we support. 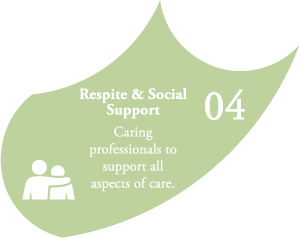 Whether our objective is to support rehabilitation or to provide long term care, each of our service models are based on ensuring these three words are adhered to. There’s no question that Genuine Health maintains the highest level of quality care and support for all individuals; and we have a 24/7 software monitoring platform that’s ensuring it. Teaming up with Fresh Focus Media and Break the Barrier Innovation, Genuine Health has devised a powerful program that assures internal accountability, clear communication and enhances the level of support being offered to everyone receiving our quality care. 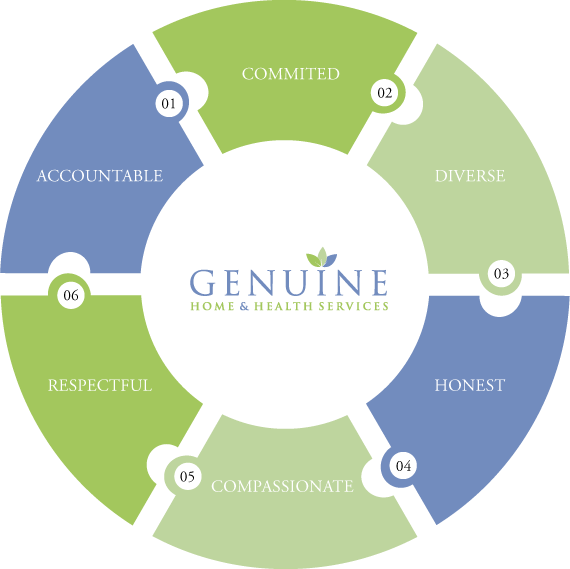 Capitalizing on the latest innovation offerings on the market today, Genuine Health empowers all individuals being supported, including any additional care members that need to be in the loop. Creating a communication platform that enhances everyone’s knowledge of what’s needed, records in detail all that’s been done and instantly allows all members of the care team to be involved insures our clients receive only the best quality of care. 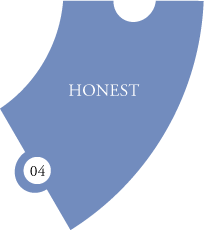 One of the aspects that truly makes Genuine Health stand out is that we guarantee a care provider. The goal of enhancing our team communication through this software is to ensure we are all on the same page with every aspect of scheduling. This includes trading shifts, holidays, sick days, etc. Applying next generation technology, we’ve found a platform that enhances our power as a team to deliver to the client, which is one of our primary concerns. Ensuring that all necessary parties have access to essential information is imperative to providing the best possible care. Providing tablets onsite, Genuine Health ensures that all client information is securely stored and available as needed. Creating standards for storing and logging essential information, we keep all client information together, organized and available. 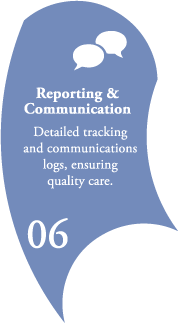 Providing care means ensuring that all documentation is properly logged and catalogued. 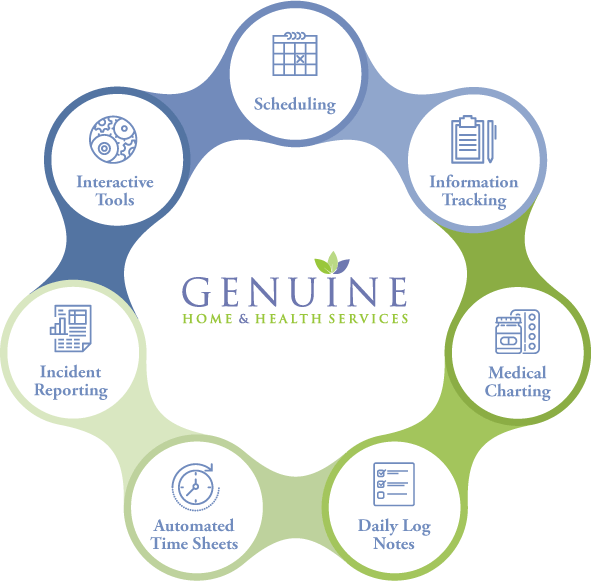 Genuine Health tracks against all assessments and utilizes digital MAR Sheets and digital medication tracking applications to ensure clear communication on all medications and strict accountability on what we deliver. In order to maintain the high standards that as a company we’re proud to deliver, we mandate that all our staff log notes daily. Maintaining communication and ensuring daily log notes are not just logged, but logged properly, is an essential element that has driven our success. Daily Check In, Real Time Essential Information, Charting, etc. The goal of Genuine Health adapting Break the Barrier Innovation digital time sheets is to provide a level of transparency for all parties. Time sheets automatically update daily so all parties involved are assured that the right time is being assigned for every shift. 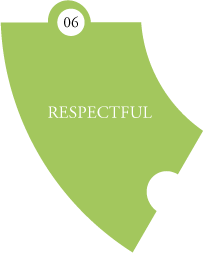 This one element has provided our company with clarity for every client, and allowed us to track quality of care and time on every site. 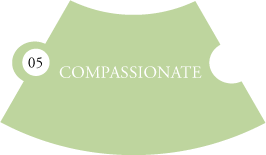 Knowing what is going on with our clients is an essential element that allows Genuine Health to react. Our digital incident reporting processes ensure that real time reporting and communication is possible. 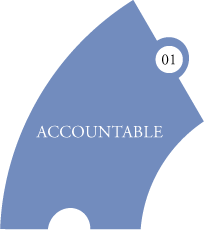 Taking the guess work out of logging, this tool empowers us to react, train and ensure accountability for all parties. As Genuine Health continues to evolve, it becomes more important to increase the tools we use with our clients while supporting them. Simple, interactive engagement tools such as digital grocery lists increase communication between support staff and the client; but most importantly empower the client. Bridging these gaps with digital tools has increased communication and client satisfaction. Checklist, Grocery Lists, Support Requests, Interactive Calendars, etc. Genuine Health will not discriminate against any employee or candidate regardless of race, color, creed, religion, national origin, gender, sexual orientation, disability, age, marital status or status with regard to public assistance. All decisions regarding the recruitment, selection and placement of employees are made solely on the basis of position related criteria. Every effort will be made when hiring new employees or promoting current employees to match their skills, knowledge, abilities and interests with positions that best utilize their talents. 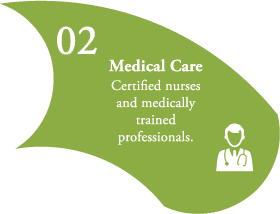 Genuine Health believes in training, building and evolving all our staff by empowering them with the tools needed to ensure the best care is always provided. I am a quadriplegic living in California, and with Genuine’s help for the last 7 years, I have been worry free when I visit my family in Canmore. Genuine is always available to assist with any staffing and supply ordering that I require when I arrive. I recommend Genuine 100%. Genuine’s caregivers swooped in like Angels when my Mother was needing end of life care. I felt comfortable to let them look after all her needs, while I was able to enjoy the last few weeks of her life as her daughter and not her caregiver. Genuine has made it possible for my husband to remain at home with our family. The staff have been knowledgeable and extremely helpful in caring for his progressive MS. The caregivers are an integral part of our family. I don’t know how we would manage each day without Genuine’s help. 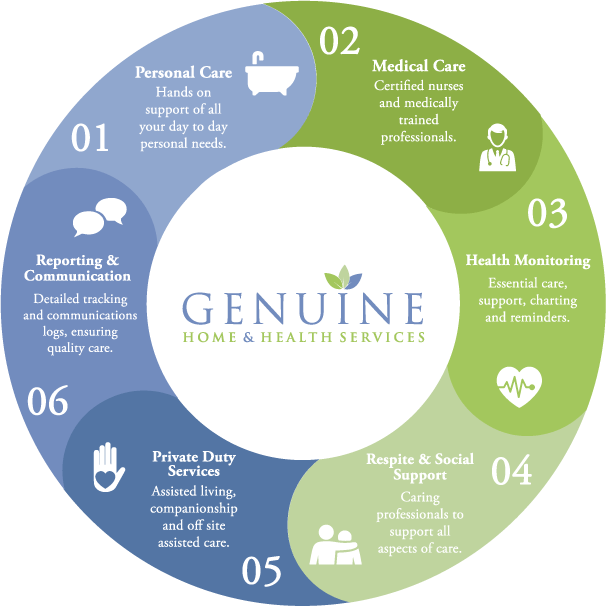 Genuine Home and Health Services’ staff has provided many hours of expertise and professional care, from AADL activities to excellent wound care. Genuine’s staff have the experience and credentials to provide the required care for my complex Spinal Cord Injury. Thank you for everything you have done to enhance my life. From day one, the staff has treated myself and my family with the utmost respect. The honesty and trust that we have in the caregivers gives me the confidence in recommending this agency to others who deserve the best care available. My 9 year old daughter requires a nurse to come to her school for G tube feedings. I have comfort in knowing Genuine’s nurses will look after my daughter during the day. Genuine has hand picked certain nurses that my daughter loves and is excited to see each day. Is your License LPN in good standing? Is your License RN in good standing? How many years of experience do you have in health care? Are you applying for a daytime, evening or a night shift position? Do you have a class 5 driver's license? What other languages are you fluent in? Our goal is to assist our clients in fulfilling their daily needs, and to support our clients and their family in maintaining a happy and healthy lifestyle while our client continues to live at home. Genuine Home & Health Services © 2017 All Rights Reserved.